Only just spotted that there are a couple of videos with some drone camera footage on Justin Smith Architects’ YouTube page – video links below. The post with some more information on the filming is here. 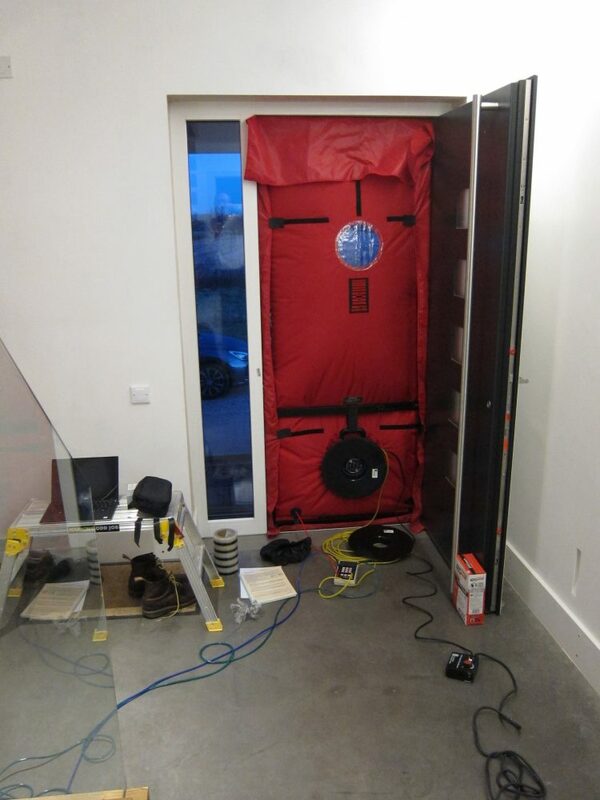 The air tightness of the building is still falling short of the Passivhaus requirement of 0.6 Air Changes per Hour at 50 Pascals of pressure – the last test came in at around 0.9. Clearly that means there’s more air leakage than there should be but the problem has been in locating where the leakage is happening in order to fix it. The architect, the contractor and myself all made enquiries and it became evident that the most practical approach was to do a thermographic (i.e. thermal camera) survey following the procedure defined in “BS EN 13187:1999 Thermal performance of buildings – Qualitative detection of thermal irregularities in building envelopes – Infrared method”. For this to work best, the outside air wants to be as cold as possible – which also means the external surfaces must not be heated by the sun. The ideal time to do the test is therefore in winter (when the outside air is cold) and before dawn (when all of the external surfaces have cooled down overnight and not yet received any sunlight). The perfect time of year is around the end of December, when dawn is relatively late and the outside temperature is generally cold. The equipment and skills required are quite specialised and only a few consultants offer this service. I contacted Apex Acoustics (largely on the basis of them having a Midlands office in Nottingham) who provide air tightness consultancy alongside acoustic consultancy. It turned out their thermographic expert is Mark Siddall (well known in the UK Passivhaus community) who is based near the Apex Acoustics main office in Gateshead. The survey was completed this morning and showed a significant leak in a store room above the balcony and a few minor leaks elsewhere. I’ll update this post with some of the thermal camera photos when I get them from Mark. The plan is now to fix the leak above the balcony and to check what that does to the overall air tightness figure, with the hope that it will be enough to enable Passivhaus certification.